Delicious as an accompaniment to a meal , or it's great served over ice cream! Stir together sugar and wine in a heavy 3 qt. saucepan over low heat until blended. Add cranberries & cornstarch, bring to a boil, and cook over medium-high heat, stirring often, until cranberry skins begin to split (around 10 minutes or so). Remove from heat and mash with a potato masher to desired consistency for whole berry sauce. Or if you prefer a more pureed type sauce, let mixture cool for 15 minutes. Then pulse mixture in a food processor 3 or 4 times, or until the cranberries are pureed to desired consistency. 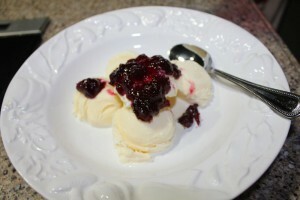 Once the sauce is desired consistency (whole berry or pureed), stir in Grand Marnier. Cover and chill 8 hours before serving. Serve chilled or at room temperature. Very nice as an accompaniment to a holiday meal, but it's also delicious over ice cream! Adapted from a recipe submitted by Leslie Sutherland, Fort Worth, Texas, to Southern Living, November 2008. **ALTERNATE METHOD: Add the orange zest, juice and the cinnamon stick to cranberries before cooking. Then follow above directions WITHOUT adding Grand Marnier, and remove the cinnamon stick when done. We like the fresh 'pop' that the zest and juice add. As Ken tells everyone, this is really good on BlueBell Homemade Vanilla Ice Cream. We also recently tried it in Cranberry Brie Bites (a recipe that seems to be all over FaceBook this year). This was a pretty and delicious appetizer that was loved by all at a recent holiday party. Preheat oven to 375 and grease a mini muffin tin with cooking spray. On a lightly floured surface, roll out crescent dough, and pinch seams together. Cut into 24 squares. Place squares into muffin tin slots. Cut Brie into small pieces and place inside the crescent dough. Top with a spoonful of cranberry sauce, some chopped pecans, and one little sprig of thyme. Bake until the crescent is golden, about 15 minutes. Serve warm.